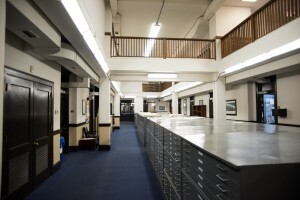 The Department of Geography maintains a variety of facilities to support its mission of research, teaching, and service. These facilities are available to faculty, staff, and students. The Cartographic Research Laboratory was established in 1982. It is a self-supporting, nonprofit facility, receiving funding through the sale of publications and through the completion of cartographic and geographic information science (GIS) projects for a broad clientele. Adjoining the University Map Library, the lab is ideally situated to handle a multitude of mapping and spatial analysis tasks. The lab is directed by Craig Remington. Visit geography.ua.edu/cartlab for more information. The Earth Surface Dynamics Laboratory is designed to support investigations in geomorphology, watershed processes and dynamics, and environmental change. The lab is fully equipped for research projects in these areas. The lab is directed by Lisa Davis. The primary mission of the Forest Dynamics Lab is to conduct research that directly improves the management of forest resources. The physical lab is comprised of four rooms, each devoted to specific tasks. The lab is well equipped for a range of projects in applied forest ecology, silviculture, and phytogeography. The director of the lab is Justin Hart. Please visit fdl.ua.edu for more information. The GIS and Remote Sensing Laboratory maintains a state-of-the-art facility for GIS data input, database management, spatial analysis and manipulation, and information output, as well as digital image processing of remotely sensed data. The lab serves students and faculty in both their coursework and research. The lab offers the latest popular GIS and remote sensing software packages, such as ArcGIS and ERDAS Imagine. The University Map Library is located in room 300 in Farrah Hall. The map library is a regional depository for the U.S. Geological Survey and includes over 1,700 monographs, 270,000 maps and 75,000 aerial photographs.The library’s days and hours of operation are Monday through Friday, 8 a.m. to 4:45 p.m. Handicapped parking and an alternate entrance are located at the back of Farrah Hall. Geospatial Services Manager Johanna Engstrom oversees the Map Library, which now hosts a page with a selection of GIS data. Laboratory space for research and teaching in physical geography is located in Farrah Hall and the Biology Building (a short walk away). In addition to teaching labs, the department contains labs devoted to climatology, soils, geomorphology, and biogeography. All labs are well equipped to support investigations in the specialty areas of the their directors. The SDML strives to improve scientific understanding of planetary surface processes and dynamics through design and utilization of state-of-the-art numerical models. In order to address the immense complexity of surficial systems research in the lab spans across spatial and temporal scales and scientific disciplines. The lab director is Sagy Cohen. The Graduate Student Computer Lab is located in 320 Farrah Hall. The lab contains 12 computers with the software that is most commonly used in geographic research. The lab is open for use by current geography graduate students and serves as a focal area for student interactions.